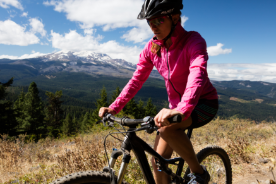 This fully guided mountain bike trip package, powered by our partners at Western Spirit, travels one of the Northwest’s most well-built trail areas - Mount Hood, Oregon. 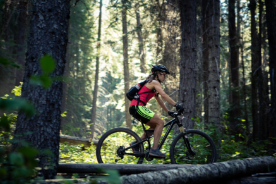 Situated on the eastern flanks of the massive volcano, these singletrack mountain bike trails wind through the Mount Hood National Forest and are known for their incredibly smooth flow. Well-constructed ridge top trails provide you with surprise views of snowy Mount Hood before enjoying sweet descents in the shadows of the lush forests. 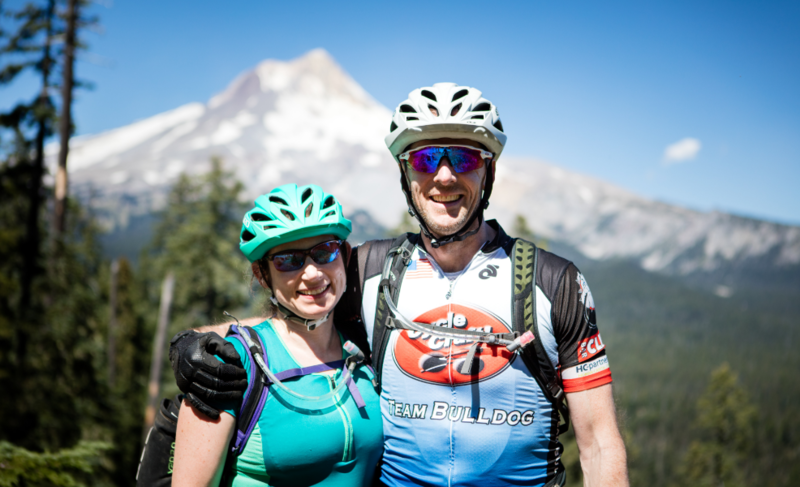 This 5 day and 4 night guided Mount Hood mountain bike trip is designed for experienced singletrack riders who enjoy climbing as much as they enjoy descending. Our small group of riders will bike a new section of trail each day before riding back into our base camp for the week. 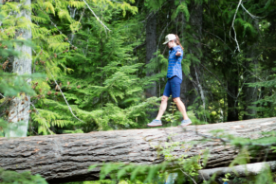 The camp offers great hiking options and even a cold creek to jump in after our rides. Riders will be accompanied by a guide each day of this trip. Please arrive in Hood River the day before we depart. Located 60 miles east of Portland, Hood River is a gateway city to Mt. Hood and is very popular during the summer months (you’ll see why when you arrive!). It is a good idea to book your rooms several months in advance if possible. We recommend the Hood River Hotel, a short walk to our meeting spot. We will meet at Dirty Fingers Bike Shop in Hood River at 9am and load up into the shuttle. We have a short drive 30 miles south to Bennett Pass on the shoulders of mighty Mount Hood. Once we pack a lunch for today’s 19 mile ride we’ll begin a relatively gentle climb up old doubletrack from the pass.This fun trail twists and turns before bringing us to the high point of the trip at 6,000 feet. The spectacular viewpoint includes the distant dormant volcanoes of Mount Adams and Mount St. Helens. From here we descend some fast and flowing singletrack down to our camp in the forest. Today’s ride is all about descents first! This loop starts with five miles of ripping downhill along Fifteen Mile Creek through a mixed forest of fir and Ponderosa pine, open meadows and some really cool hoodoo rock formations. After crossing the creek we begin to climb, and you can relive the awesome downhill in your mind as you work your way back to camp. Because of the challenging nature of today’s ride, your guides can help tailor the ride for you, with mileage options from 10-22 miles for the day. Once we return to camp cold drinks and a delicious meal await. 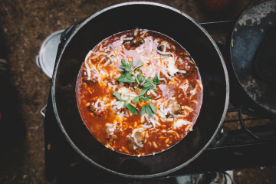 We begin again by fueling up with a relaxing and hearty breakfast. Our 14 mile ride today brings us on a cloverleaf shaped route of more classic Mount Hood trails. 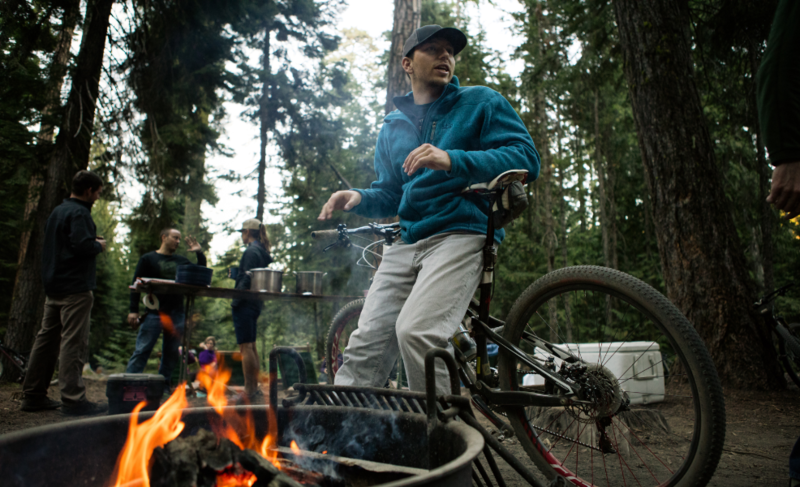 We ride from camp, starting with some gentle climbing to the Five Mile Butte Lookout Tower. This takes us to an amazing descent of banked corners, small water bar jumps and some tight singletrack riding. Several small creek crossings and some short steep climbs ensure a good night’s sleep. 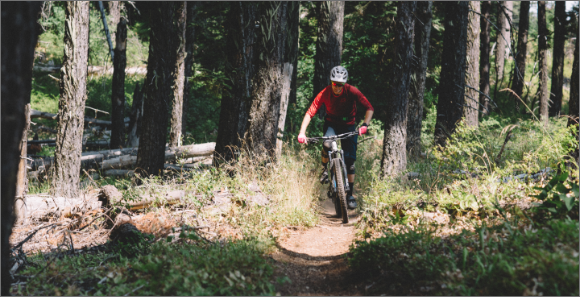 Today we’re off to the Surveyor’s Ridge Trail, which is, deservedly, one of the most well known and loved mountain bike trails in all of Oregon. It trades the sustained grades of the previous days for a roller coaster of ups and downs and more breathtaking views out across the Hood River Valley. Mid-summer fields of wildflowers brush your handlebars, so be sure to pack your camera. You will have the choice to take it easier or push yourself with 14 - 29 miles in the saddle. We end our trip on a downhill note—2,300 vertical feet of downhill to be exact! The Dog River Trail, (or just “The Dog” in the local vernacular), will leave you with sore forearms and a dusty grin from ear to ear. We’ll hit a section of Surveyor’s Ridge that we missed yesterday, but once we reach The Dog, check your brakes and hold on tight. After our big 14 mile descent, we’ll enjoy one final lunch together before heading down to Hood River and the real world. 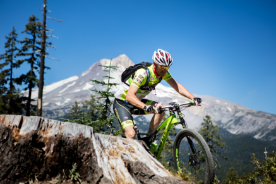 The singletrack mountain bike trails around Mount Hood are famous for a reason, from spectacular views of the surrounding volcanoes to impeccable descents, these trails are a PNW must ride. The Surveyor's Ridge trail has all the hallmarks of a PNW classic - quick climbs and descents, techy sections, and uninterrupted mountain views. 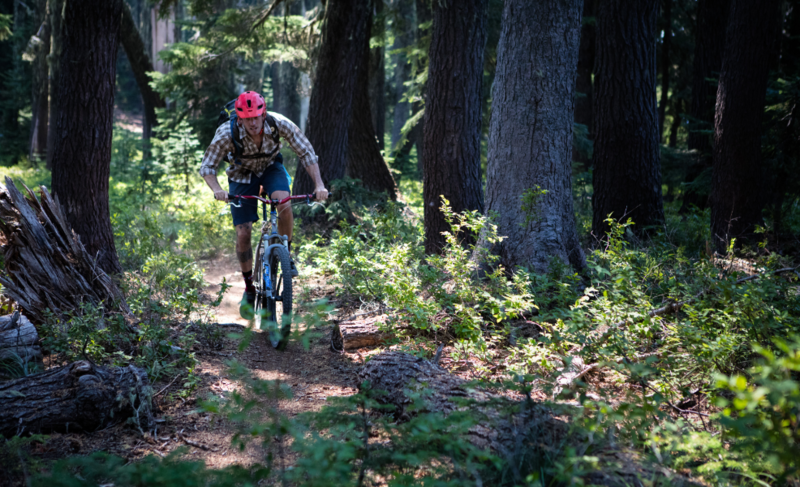 The Dog River Trail, meanwhile, climbs steeply through Oregon forest and lush wildflowers and riders are rewarded with a high speed downhill experience to rival any other classic. 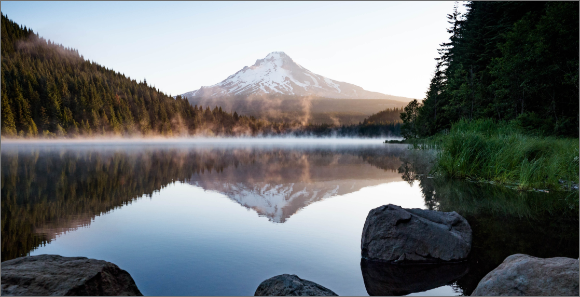 Travel to and from Hood River, Oregon and any pre-trip or post-trip lodging. Travel insurance (we recommend World Nomads). Personal camping gear (can be rented from Western Spirit for $90 per trip ). Mountain bike (can be rented from Western Spirit for $55 per day). Alcoholic beverages. Guide gratuity. This is an intermediate-advanced mountain bike trip. You should have experience mountain biking on singletrack and feel comfortable descending and climbing on narrow trail. The trail surface is made up of loamy soil, clay, rock, and some small rock gardens. Riders should expect to be in the saddle for about 5 to 6 hours per day. A 2019 Specialized Stumpjumper 29’r with dropper post, and helmet can be rented from Western Spirit for $55 a day. You MUST bring your own pedals if you ride clipless. Bikes will come with flat pedals. We recommend you use a 3-bag system: Camping gear and personal items for camp (gets packed away and is inaccessible throughout the day), Small daypack (stays in vehicle and is accessible throughout most days, e.g., extra layers, prescription medications, extra snacks, etc. ), hydration pack you wear (all things you readily need, right there on your back). We recommend a 2-liter hydration system (e.g., Camelbak) to carry the things needed during the day (water, snacks, lunch, rain gear, extra layer, sunscreen, camera, etc. ), and to easily hydrate without stopping. We have carefully developed this list to insure your comfort on the tour regardless of the weather. 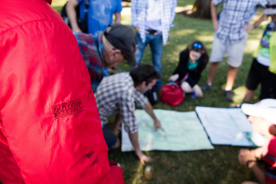 If you are prepared for extreme weather, it is an adventure. If you are not prepared, it can be a serious problem. We recommend the layering system, including a wicking or long underwear layer, an insulating layer and a weather barrier for wind and rain. This list reflects that philosophy. weather can be unpredictable so be sure to bring all the warm clothing and rain gear listed! We have a maximum of 13 guests on the trip. We do not have a minimum number of guests per trip. Warmth, humor, seriously good people skills, professionalism, competence. They execute their very serious confidence-inspiring grace. To begin with the landscape and scenery was majestic and awesome. The guides were all instrumental in enhancing that experience with their knowledge, skills and out of the goodness of their character. The guides were fun, the food was WAY better than I expected, the rides were tailored, guiding was superb, trails were a blast, our campsite was sweet. I have zero complaints.